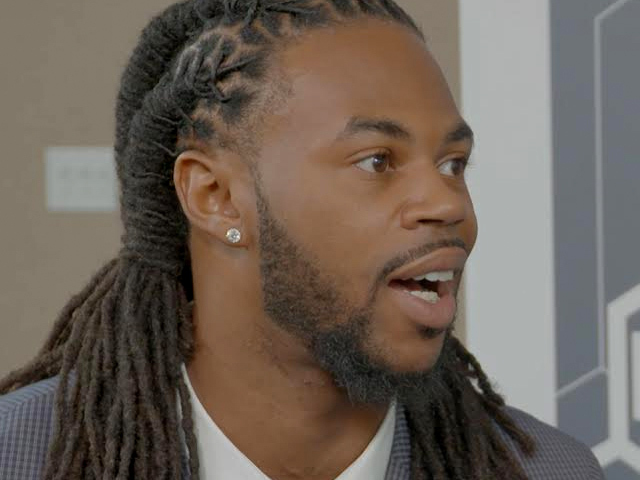 Months after the Seattle Seahawks won the 2014 Super Bowl Championship, Sidney Rice made a surprise announcement, at the age of 27, that he was walking away from the game after seven years in the NFL. Rice is now speaking openly about the health concerns that led him to retire. In an interview with CBS News, Rice said he had experienced several concussions and would sometimes black out after particularly bad hits. As he spent the off season making his decision, Rice said he was particularly struck by the stories of former NFL players Tony Dorsett and Herschel Walker. "You have these guys that have been going to the same house for 25 years. And all of the sudden they get to a certain point on their way home and they have to call their wives to get the directions home. So that is something that really hit home for me after having experienced so many concussions," said Rice. On Monday, San Francisco 49ers linebacker Chris Borland made a similar decision, retiring after his rookie season at the age of 24. Borland told ESPN's "Outside the Lines" he decided to leave the game because of concerns about head trauma. For Rice, early retirement ended an NFL career that began in 2007 as a second round draft pick followed by four seasons with the Minnesota Vikings. He exploded on the scene as a 23-year-old in 2009, catching 83 passes for 1,312 yards and "looking like a future superstar," said CBSSports.com senior NFL writer Will Brinson. Rice was voted to the Pro Bowl after the 2009 season, and tied a league record with three receiving touchdowns in the NFC Divisional Playoffs against Dallas in 2010. Rice signed a five-year $41 million contract with the Seahawks in 2011, but was released with two years remaining partly due to his injuries. He re-signed and was reportedly making under $2 million at the time of his retirement in July 2014. Though Rice had no signs of post-concussion disorder when he retired, he said he wanted to leave the game before that changed. "I don't regret any time on the field," Rice said. "I enjoyed every year of my seven years I had a great time, and it's over with. It's time to try to help people out." The NFL is under intense legal pressure to acknowledge and compensate former players for brain trauma suffered on the field. The league is currently negotiating a legal settlement which, some reports say, could approach $1 billion. In an interview this month with WLNY-TV, Rice said he did not join the lawsuit since at this point he shows no signs of brain trauma. Dr. David Grand, a brain trauma specialist who focuses on concussions, said many retired athletes are now realizing how professional sports permanently changed them. "They just can't think and react the same way as they used to," Grand said. "And athletes are people who have tremendous reflexes, tremendous capacity to react. So when theirs is less than the average person, they've gone from a peak to a valley." Repeated concussions can affect a player's thinking, reaction time, ability to focus and recall past events, physical equilibrium and more, Grand said. He called Rice's decision to retire rather than risk further injury "incredible." "He's thinking about the rest of his life," Grand said. "Because there are athletes who have a concussion in the game and they have to take their helmets away from them because they want to go back out. Athletes are wired to play and wired to perform. And athletes are not really taught to protect themselves." Rice agreed that professional athletes live in a culture that discourages them from admitting to a concussion and taking the time needed to heal. "You want to get back out there on the field. You don't want to your opponent to see your hurt. So a lot of people try to rub the doctors off and tell them that they're fine, which they're really not. I've done the same things in games," he said. Protecting his future was Rice's main motivation in quitting the NFL, he said. "I wanted to be able to function," Rice said, and added that he's looking forward to enjoying time with family and friends. Rice hopes parents and kids will learn from his story and understand the risks of contact sports. "They need to educate themselves first," he said. "And then I am pretty sure a lot of them won't let their kids play at such a young age." For the kids, Rice has a message: "Life is more than football," he said. He cautions against the competitive impulse to stay in the game even after injury. "If anything happens, if they experience any problems, they blackout, or seeing stars, anything of that nature, they should tell their coaches or their parents," he said. Earlier this month, Rice, along with New York Giants punter Steve Weatherford, announced they would donate his brain posthumously to scientific research. "I felt like it was the right thing to do, for the generations to come," said Rice. "If there is a way that I can help, prevent, or protect the kids that are coming along, I'm all for it." Rice acknowledged that by talking about his concerns, he is taking an uncommon step. "My story is unique because I'm willing to talk about it," he said. "A lot of the guys don't talk about it, they don't speak about it. They go, they play, their done and that's that. If we continue along that path then what kind of example are we setting for the youth that's coming along?"